Suzhou is a major city located in southeastern Jiangsu Province of East China, about 100 km northwest of Shanghai. It is a major economic center and focal point of trade and commerce. The city is situated on the lower reaches of the Yangtze River and the shores of Lake Tai. Founded in 514 BCE, Suzhou has over 2,500 years of history, with an abundant display of relics and sites of historical interest. 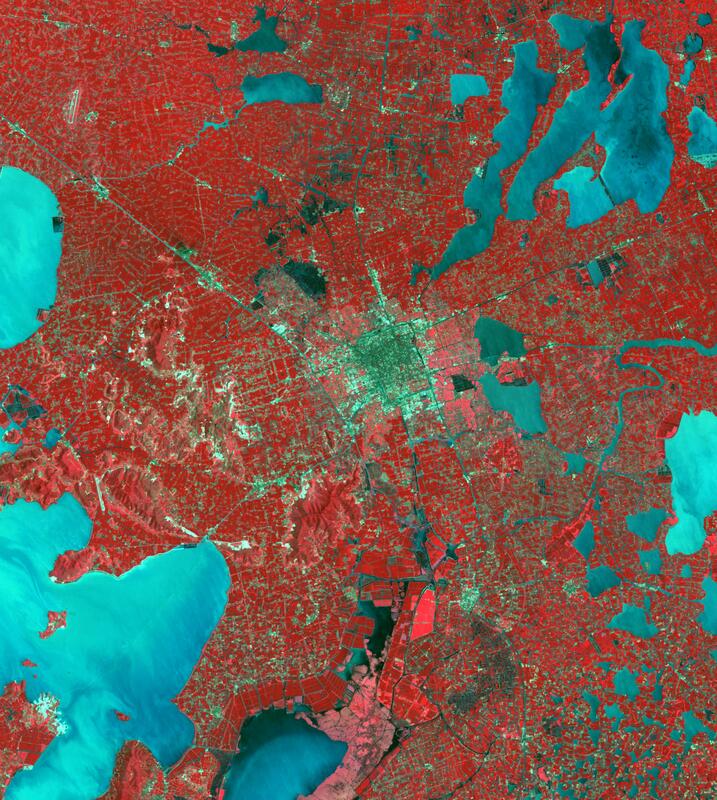 Since major economic reforms began in 1978, Suzhou has become one of the fastest growing major cities in the world. The population has grown from 0.9 million in 1990, 2.2 million in 2000, 4.1 million in 2010, to 5.3 million in 2017. The Landsat TM image was acquired August 4, 1984, and the Aster image was acquired August 2, 2015. The images cover an area of 48 by 53 km, and are located at 31.2 degrees north, 120.4 degrees east.